The problem I have with the endless emails and web articles I see about “16 Thanksgiving side dishes” and “10 million pies” and “what to make for Thanksgiving this year” is that, like many people, I like to make the same things for Thanksgiving every year, and I don’t use recipes for most of them. When I’m in charge of dinner, I generally make turkey, mushroom-sage stuffing, mashed potatoes, gravy, roasted sweet potatoes, creamed spinach, and pecan pie. And I don’t need other people telling me how to make those things, as I’ve already done them, thanks. I was going to do a roundup of Thanksgiving recipes from the past three years of my blog, only to discover that I haven’t really written most of them down – for the above reason, that I don’t really follow recipes for this sort of cooking. I do use a recipe for pecan pie, but it’s pulled straight from Baking Illustrated so I don’t really want to reprint it here and have the fine folks at Cook’s Illustrated come after me with pitchforks. 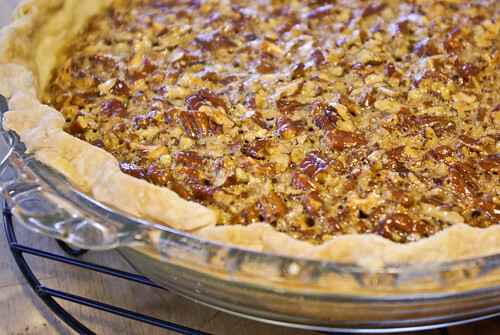 I have found a few good recipes to mention here – the fresh cranberry relish with a whole orange that I like so much, sweet potato dinner rolls, the spinach recipe that isn’t remotely healthy but tastes fantastic, and a cranberry tart that doesn’t replace pecan pie in our household but is still really nice. Aunt Mary’s creamed spinach recipe needs to be in the national archives.